4. Lock Cover (Old-style, Coca-Cola) — Royal Vendors, Inc.
MODELS: All Coca-Cola and Cold Drink venders P.O. #1172 and before. 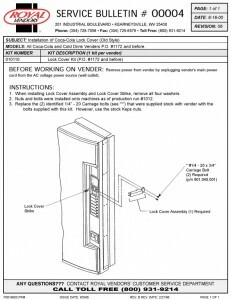 This bulletin describes the procedure for installing a lock cover on Coca-Cola and Cold Drink venders built before run 1172.